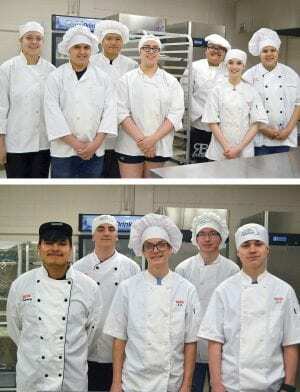 The Mobridge-Pollock culinary arts classes will be showcasing their skills as they participate in the annual competition on Wednesday, May 9. Each year the classes show off what they have learned in class with a judged competion held at the end of the year. The classes are divided into teams with each member of the team assigned tasks that test the skills they have learned through out the year. Members of the classes competing in the event are Memphis Yellow, Zack Hannon, Darcy Kelley, Jaden Waldner, Brady Malmedal, Jaydlynn Nickols, Zyen Fischer, Isaiah Tree Top, Summer Wingate, Ethan Black Fox, Eliza George and Jaya DeMarrias. During the competition the teams of two will prepare a main course and either a dessert or appetizer. Teams of three will prepare all three courses. The entrees must have two sides. The teams have 20 minutes to measure and cut foods; then 60 minutes to actually cook the food and plate. They are judged on safety and sanitation, time management, organization and technique, as well as taste, plating and cost. The recipes below are those that will be used during the competition. Each team selected their recipes for the competition. This is an adaptation of the National Restaurant Education Foundation’s ProStart Competition, which was just held in Providence, R.I. The winners of the competition will be announced at the awards ceremony on Thursday, May 10, at the Middle School Theater. In a large skillet heat oil over medium high heat. Season chicken with salt and cook until golden brown on each side until crisp and cooked through. Transfer to a plate and set aside. Add garlic cloves to skillet until golden brown about 2 minutes. Transfer to the plate of chicken. Return pan to medium high heat and carefully pour 1/2 cup of water scraping down the browned bits. Whisk in the brown sugar until dissolved. Then cook until mixture turns a deep amber color. About four minutes. Carefully add vinegar and stir to dissolve. Add ginger, garlic, broth and soy sauce. Bring cooking liquid to a boil and whisk occasionally. This takes about 10 minutes. Be patient. The sauce will thicken and glaze the chicken beautifully. Once glaze is ready, turn heat to medium low and return chicken to pan until heated through. Serve over rice and garnish with scallions or green onions if desired. Serves 4. The original recipe used 2 1/2 pounds bone-in chicken legs and thighs. If you plan on doing this, you will need to increase the cooking time of the legs and thighs in the sauce to about 20-25 minutes to ensure they are cooked through. 1. Preheat oven to 400 degrees. In a small bowl, mix honey and 1 tablespoon oil. Add tomatoes and toss to coat. Transfer to a greased 15-inch by 10-inch by 1-inch baking pan. Bake 5-7 minutes or until softened. 2. Pound chicken breasts with a meat mallet to 1/2-inch thickness; sprinkle with salt and pepper. In a large skillet, heat remaining oil over medium heat. Add chicken; cook 5-6 minutes on each side or until no longer pink. Serve with roasted tomatoes; drizzle with glaze. To make your own balsamic glaze, bring 1/2 cup balsamic vinegar to a boil in a small saucepan. Reduce heat to medium; simmer 10-12 minutes or until thickened to a glaze consistency. Makes 4 servings. Mix the above ingredients and marinate the steak for 20 minutes. Steaks can be grilled or a grill pan used to cook the steak.